CASE: 38mm, stainless steel, antimagnetic. Blank first series caseback. CONDITION REPORT: The dial shows slight signs of aging with and the luminous material has an amber patina. The case is in great condition. The antimagnetic movement cover as well as the washer is included within the case. The hands appear to have been refilled and do not react to UV. The radium on the dial reacts properly to UV and Geiger test. 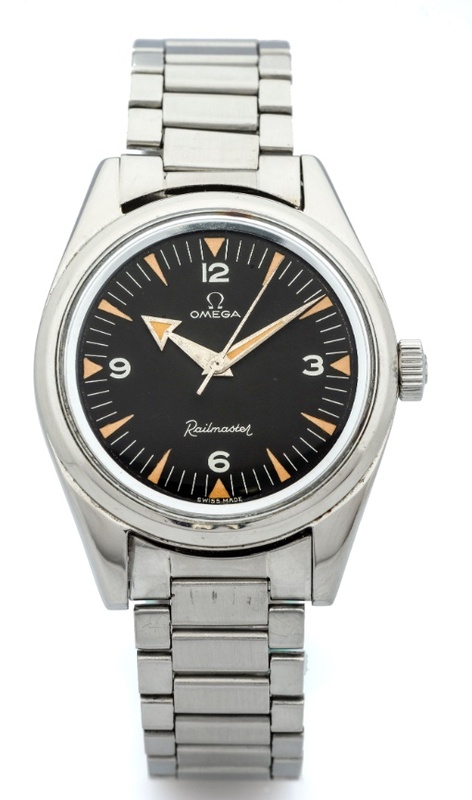 Notes: According to the Omega Museum, the present watch was manufactured in 1957. The Omega Railmaster ref. CK 2914, the predecessor to the 135.004, was launched in 1957 (part of the “Holy Trinity”) and designed for professionals such as scientists, technicians and electricians working within close distance of powerful electric currents. This antimagnetic watch has a special 1mm (instead of 0.4mm) thick mat black dial, with luminous hour markers and broad arrow hands (radium).